The other day in a used bookstore I came across a book called ‘The Children’s Garden Book’ by Olive Percival. The first line of the forward is, “This is a book of suggestions for children to whom destiny has given such golden things as a plot of ground and many hours, or several years, uninterrupted by the city’s call (ever more insistent, clamorous) to indoor amusement”. And further down, “If, for the first ten or twelve or fourteen years of life, the children of today could have personal flower gardens in which to play, to study, to read, to work, to dream, the world tomorrow would be greatly lightened of it’s ugly and menacing burden of materialism and general faithlessness”. The next section of the book are thoughts and notes to the “to the young gardener”. Thanks to the internet you can read all about tussy-mussies! The books goes on with more tidbits and advice and then she shares her garden plans for children. Things like “the Fairy Ring”, “The Kate Greenaway Garden”, and “the Moonlight Pleasance”. Each garden comes with a plant list, and illustration and planting plan and text describing details of the garden. It is so sweet. I fell in love with Olive Percival.Besides being a gardener of some fame and a published writter and poet, she was also a book collector, an expert on Chinese and Japanese art, a traveler, and a photographer. I have acquired one other book written by her, “Our Old Fashioned Flowers”. The Huntington Library in Pasadena, CA has her diaries and photographs. – Olive May Graves Percival (July 1, 1869 – February 18, 1945). Oh, and someone’s term paper on her life here. There’s a tiny old one over by Lake Merritt. I can’t find a picture of it right now. 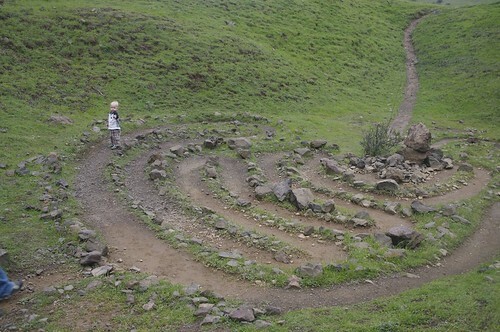 I know there is another labyrinth in Tilden somewhere but I haven’t made it out there. 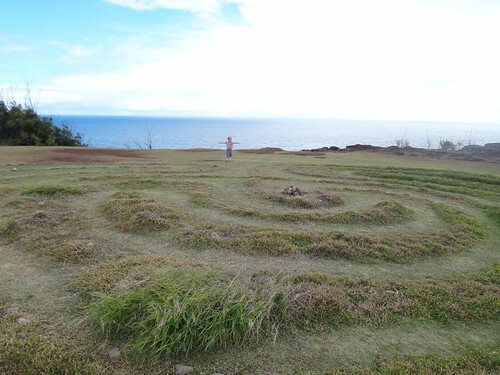 Okay, this one is on Maui. I can dream it is about town. 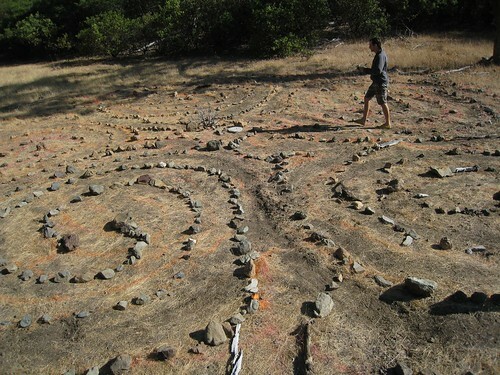 This is the labyrinth I talk about here and here. About 5 years after NIMBY moved to a new location in East Oakland I finally made it over there for a fundraiser and got to check out the space. The first thing I noticed that there there were plants everywhere and I was really surprised. Thinking about it now I’m not surprised at all. 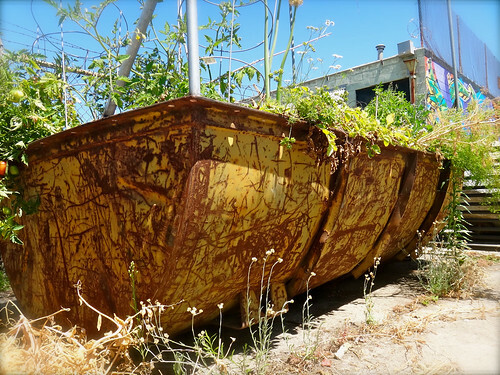 who better to create gardens from cast off junk than the founder of the largest do-it-yourself industrial art space in the Bay Area? 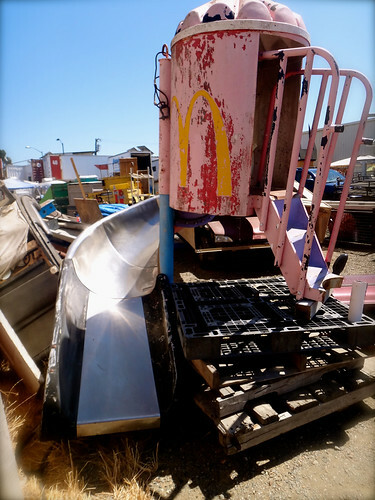 The second thing i noticed was that they have an old metals twisty slide from a Mcdonalds and I WANT IT! Like, really want it. It could totally fit in our side yard and would be awesome. I counted about 5 big trays of food plants and many smaller pots scattered about. That’s a lot of fresh veggies to share! 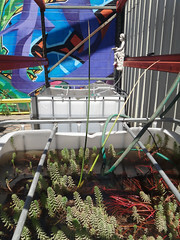 And here are the beginnings of some aquaponics tanks. I think they could build a decent chicken coop on top of this that dogs would not be able to get in to. A sort of chicken condo, if you will. 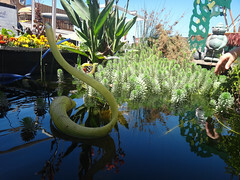 Then there was this huge tank filled with beautiful glass sculptures, fish and plants used to a be a huge gas tank. I think? I could be remembering wrong, but either way, it was very pretty and soothing! 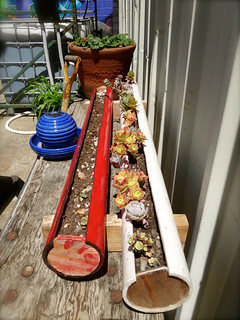 And outside, there were these great plastic pipes filled with succulents. I can see this working really well on a back porch or even front yard. 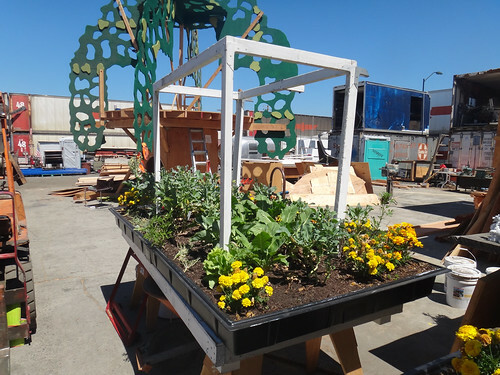 Industrial junk being turned to good use, whether for art or to grow food or to make a playground is always beautiful and inspiring! This picture is taken out the window of the Boston Children’s Museum while waiting for the tour of the authentic Japanese house (very cool, btw). I watched the painted hopscotch game get used by several passers-by. 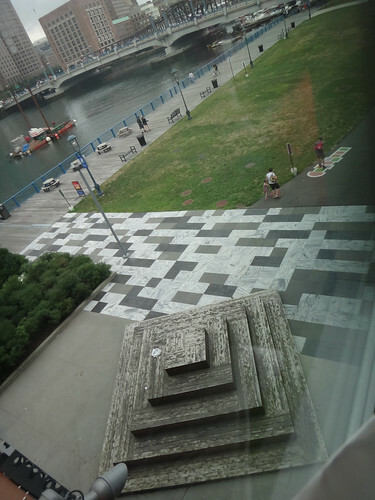 There was also a great paver maze at the entrance to the museum. I love using the ground plane as a design element, it’s something that kids especially notice and can’t resist reacting to. I stumbled on The Urban Hedgerow Project recently. Hedgerow is one of those words you may have probably encountered if you read the right sort of children’s books, the sort of children’s books where small English children roamed the countryside having adventures or maybe the sort of book where small English creatures roamed the countryside and had adventures. A hedgerow is a “A hedge of wild shrubs and trees, typically bordering a road or field.” It’s a gathering place, if you will, for all the small animals and insects that need a place to live but can’t live where people live and work. Mice and bunnies and bees and ants are often considered pests but not only are they super cute, they need to live as well. In urban environments these creatures are considered even more pesty and unacceptable than the country or suburbs. Here’s a description of The Uban Hedgerow Project. The Urban Hedgerow makes space for the feelings and thoughts that urban wild animals and plants provoke. 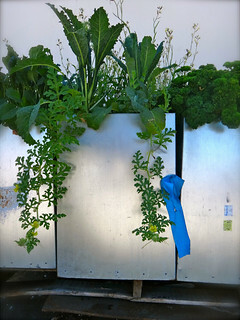 Instead of a row of trees, we are exploring wall-mounted vertical forms that will comprise varied substrates, from repurposed industrial components like plastic tubing and lumber discards, to habitat for indigenous plants—hosts to indigenous fauna. 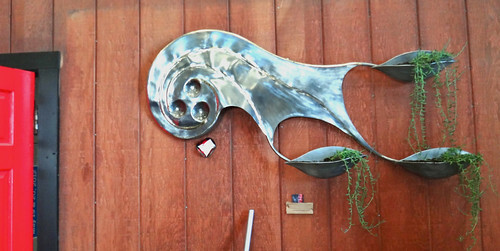 This project is parts art, political and environmental statement and is very thought provoking and beautiful. 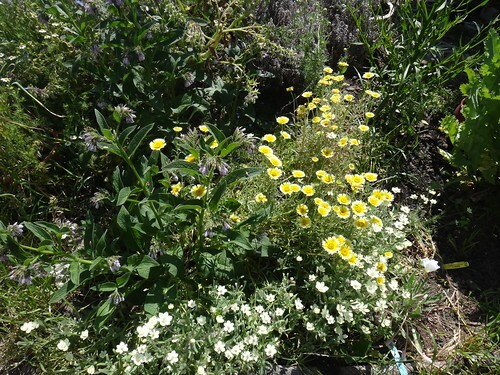 The first time I ever saw anything like this is was some instructions on how to make a wild bee habitat. I can’t find the exact one I remember but The Consensus Life has a nice couple of tutorials here. 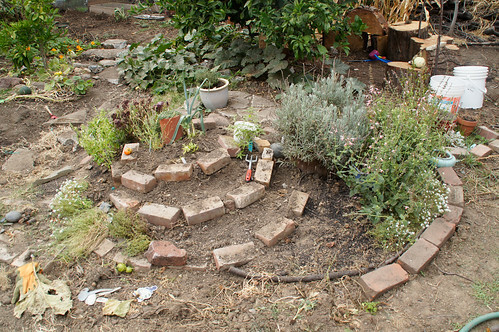 Here is an Instructable for another kind of bee habitat. and.. another one from the National Wildlife Foundation. But this basic idea can spawn a ton of similar projects. For instance, what if all you have is a porch or you are allergic to bees and don’t want to risk getting stung. You can still create a fun project for your kid and I love this Insect Habitat from a shoebox idea from Indietutes. Simple and fun for a little! 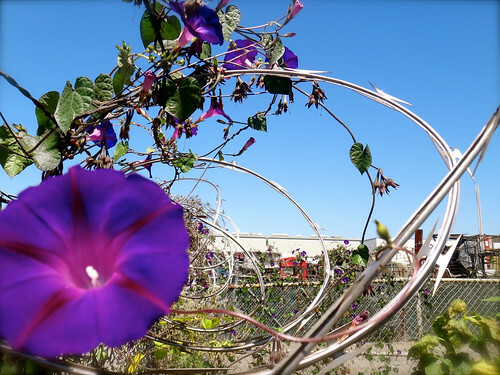 Read more about the idea of urban hedgerows at Pacific Horticulture. 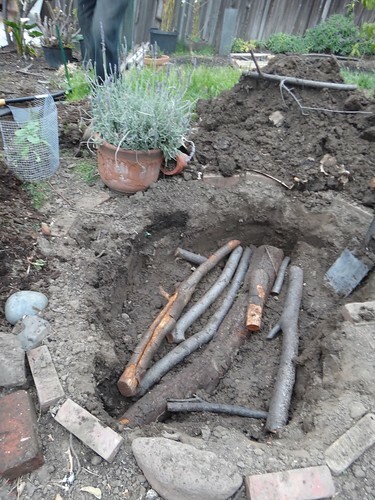 When we moved in and had an arborist come cut down some of the plum trees we kept all the branches. 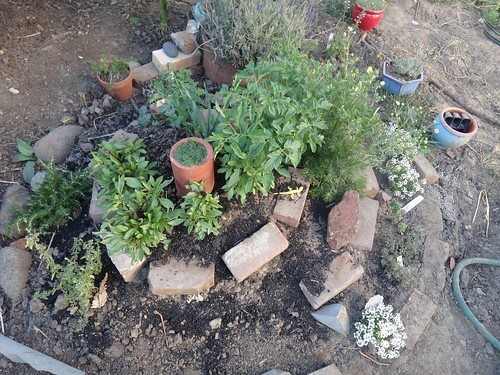 When I was making my herb spiral I dug a hole to mix in compost and such and I buried some of the plum branches in a nod to Hugelculture. 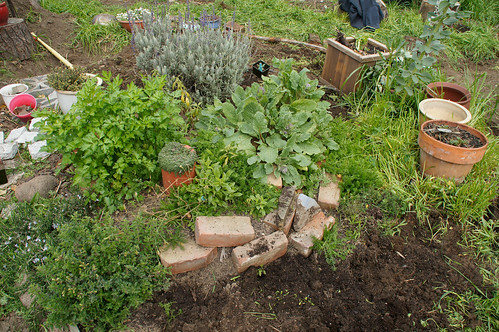 We also piled up most of them along the back wall and dumped dirt on it and hove things growing on it (oh, and an embedded hillside) in a more traditional hugelculture bed. 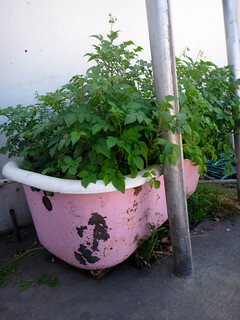 I enlarged it to include an attached bed for flowers. I had a fantastic crop of borage, chamomile and comfrey plus some nice annuals this spring. I have prepared the bed for some new things but I’m not sure what. I already sprinkled some seeds randomly and put in a few ground cherries. There is also some lovely lovely smelling lemongrass and some valerian in there plus some basic herbs like rosemary and oregano.